I manage the website for St Ives Guildhall - and I'm working alongside St Ives Town Council to help promote the venue and events there. Our aim is to make it a popular place to hold events of all types - maximise ticket sales - and so to ensure its long term financial viability. An asset for the whole town and another attraction for our visitors. 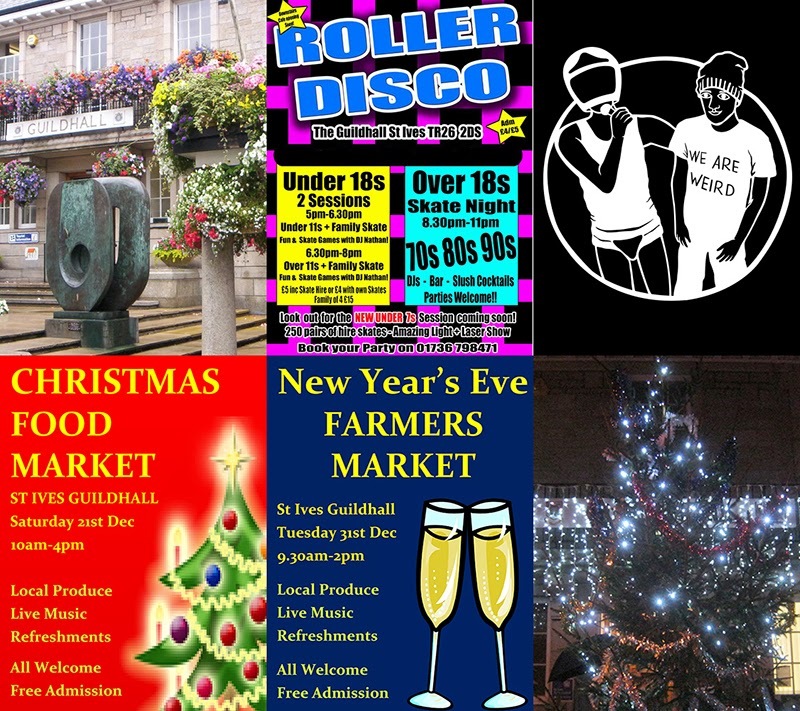 You may have seen events listings for December - around town and online. Unfortunately - and I'm sure unintentionally - some of these contain a few errors and omissions. So I just want to update everybody on what is actually happening at St Ives Guildhall in December 2013. The Town Carol Concert - as every year - is on the first Sunday of the month - which this year falls on 1st December. Organised by local churches and a fundraiser for Edward Hain Hospital. Its NOT on Friday 29th November. Friday 29th November sees our regular Rollers Roller Disco - which rolls on every Friday through December - with three sessions - for kids, families, teenagers and adults - starting from 5.00 pm. Saturday 7th and Sunday 8th see a Christmas Craft Fair - local arts and crafts. No details yet of stallholders and entertainment - .these will be posted when known. On Saturday 14th something new - comedy from Headluv and Passman - Cornish Rapppers. On Saturday 21st - there is a Christmas Food Market - organised by St Ives Farmers Market. But please note that the regular market continues on Thursdays 5th, 12th and 19th. Plus - there is a special New Years Eve Farmers Market. Finally - some good stuff is already booked for January and February - tribute bands Oye Santana and The Rollin' Clones. Plus - September Festival patron and one half of Show Of Hands - Phil Beer. Have a great Christmas and New Year in St Ives !